The week is almost at an end, and so it's time for a Thursday Kotaku evening open thread. How has your Thursday been? Have you Seattle-ites been keeping out of the snow? Have those of you in the rest of the country been keeping from being too holier-than-thou about how much snow you get each winter? Here, culled from the world wide internet, is a collection of potential conversation-starters and other cool crap. 30 Japanese Giant Hornets Kill 30,000 Honey Bees - Holy crap! Holy! Crap! The carnage! Here, the bees fight back - You guys, there is a shadow war going on right under our noses! Never a bad time for an Archer Rampage! - The show returns tonight. I'm stoked. Lots of good TV coming back on the air this week! Have you been following Stephen Colbert's whole Super-PAC affair? - I hope so. It's been hilarious. The latest is a Super-PAC attack ad on... himself. Narrated by Samuel L. Jackson. The Hobbit Trailer but with cats - Stuff of nightmares. "The Girl with the Dragon Tattoo in under 5 minutes" - I haven't read or seen this movie, so I avoided spoilers. But I have heard this is funny. 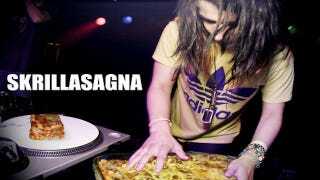 "Cooking with Skrillex" - Let's close with this one. Bwa. And that's what I got. Chat with clear eyes and full hearts. You can't lose.